The 40th British Columbia ( BC ) General Election, scheduled for May 14th, 2013, will elect the 85 members of the Legislative Assembly in the Canadian province of British Columbia. The BC Liberal Party formed the government during the 39th Parliament prior to this general election, initially under the leadership of Premier Gordon Campbell, then, after his resignation, Christy Clark. The New Democratic Party ( NDP ) under the leadership of Carole James, and then Adrian Dix, formed the Official Opposition. The BC Green Party under the leadership of Jane Sterk and and the BC Conservative Party under John Cummins, though they had no representation in the last parliament, have also been included in the 2013 General Election. 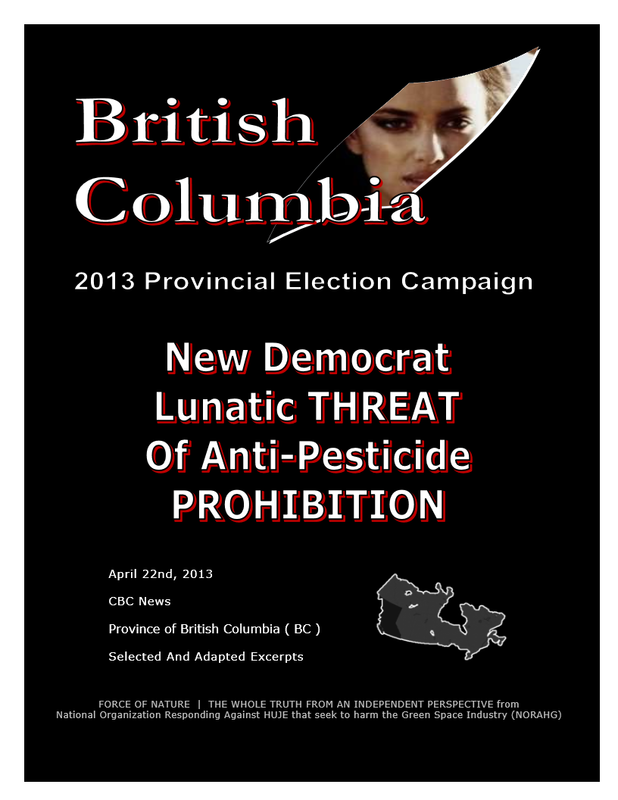 New Democratic Party of British Columbia is a social-democratic political party that operates as the POLITICAL SHIELD for Anti-Pesticide and Environmental-Terrorist Organizations. Prior to the 2013 Provincial Election Campaign, NDP also operated as the official opposition to the governing Liberal Party, following the 2009 Provincial Election. The LUNATIC ENVIRO-POLICIES of NDP are justified by CONCOCTING the PRETEXT of somehow protecting the environment. 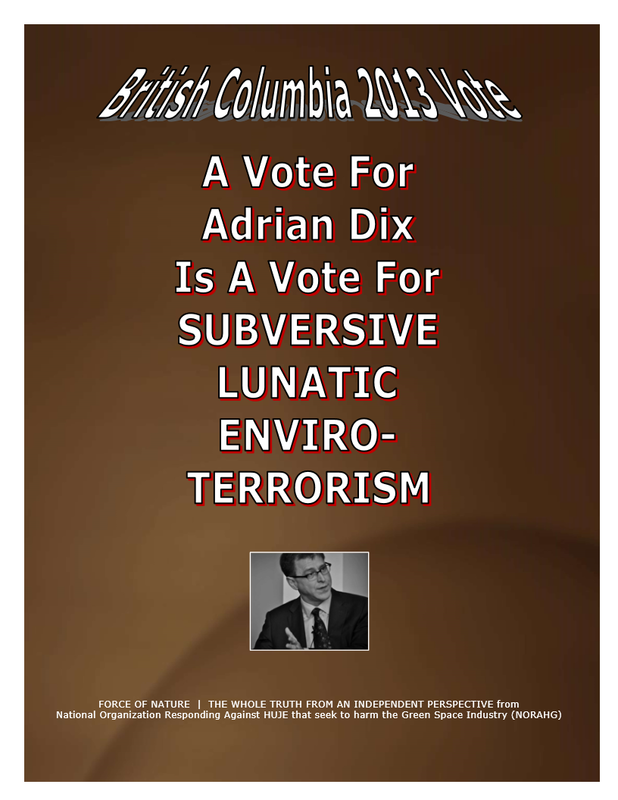 In British Columbia, Anti-Pesticide and Enviro-Lunatic NDP Leader Adrian Dix rolled out his Environmental Platform ( a.k.a. LUNATIC ENVIRO-POLICIES ) on Earth Day in the City of Kamloops by reaffirming his NEEDLESS, SENSELESS, and MALICIOUS OPPOSITION against pest control products. Dix said the NDP would pass a province-wide PROHIBITION against the use of pest control products on private lawns and gardens, while BC Liberal Leader Christy Clark said AN OUTRIGHT PROHIBITION GOES TOO FAR. Dix said he will IMPOSE PROHIBITION IN DEFIANCE of a bi-partisan Special Committee that concluded in 2012 that there was NOT ENOUGH EVIDENCE TO WARRANT AN OUTRIGHT PROHIBITION. 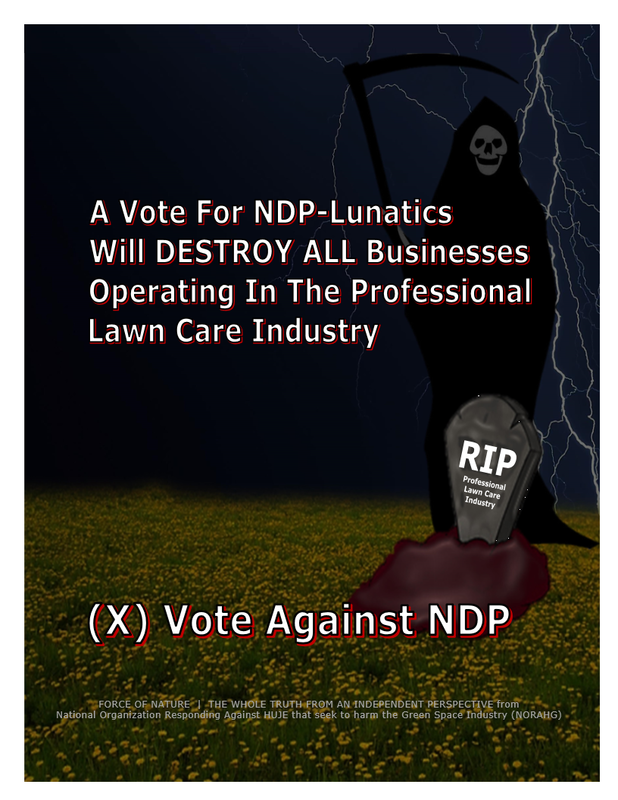 The NDP-Lunatic PROHIBITION will DESTROY ALL BUSINESSES operating in the Professional Lawn Care Industry. I guess Mr. Dix’s plan would be to ignore … what bi-partisan committees have to say, but that’s not the way I want to run government. 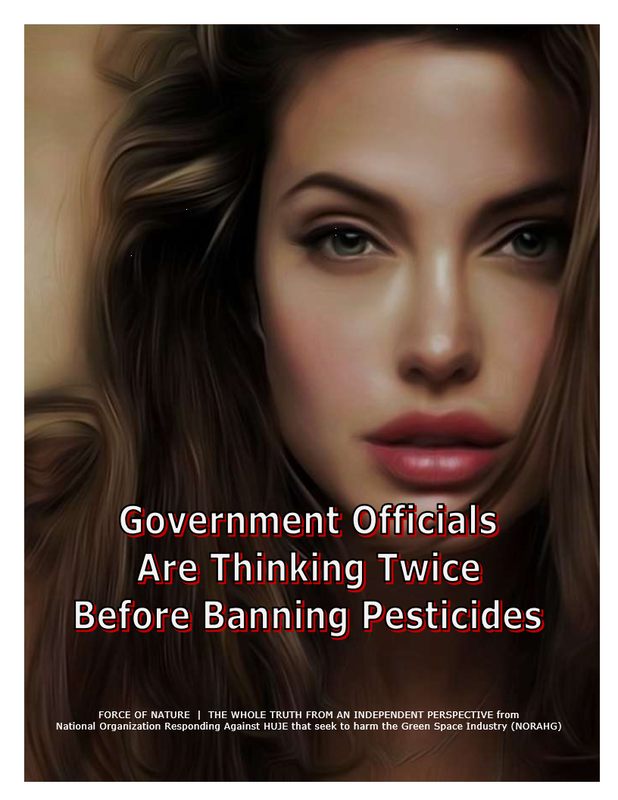 On May 17th, 2012, British Columbia’s Special Committee On Cosmetic Pesticides STOPPED THE TREND towards NEEDLESS, SENSELESS, and MALICIOUS PROHIBITION. The Special Committee On Cosmetic Pesticides announced that it would NOT RECOMMEND a provincial prohibition, and the proposal was STOPPED. In jurisdictions outside of British Columbia, Anti-Pesticide PROHIBITION led to CATASTROPHIC CARNAGE in the form of BUSINESS FAILURES, GARBAGE DUMP GREEN SPACES, STUNNINGLY EXORBITANT COSTS, HORRIFIC FINES, and even ILLNESS and even DEATH. Because of Anti-Pesticide PROHIBITION, the owners, employees, and families dependent on Professional Lawn Care businesses have faced TERROR, DESPAIR, and DESTITUTION. Pest control products are SCIENTIFICALLY SAFE, and NO HARM WILL OCCUR when they are used according to label directions. Not surprisingly, the BC Special Committee on Cosmetic Pesticides AGREED ― and deserves CONGRATULATION. Based upon the recommendation from the Special Committee, on February 20th, 2013, legislation was introduced in British Columbia that would GRANT an EXCEPTION STATUS to businesses operating in the Professional Lawn Care and Golf Industries. Only CERTIFIED OR LICENSED EXPERTS working within these industries are PERMITTED to use pest control products in the Urban Landscape. The Government of British Columbia made THE RIGHT CHOICE, and deserves CONGRATULATION. 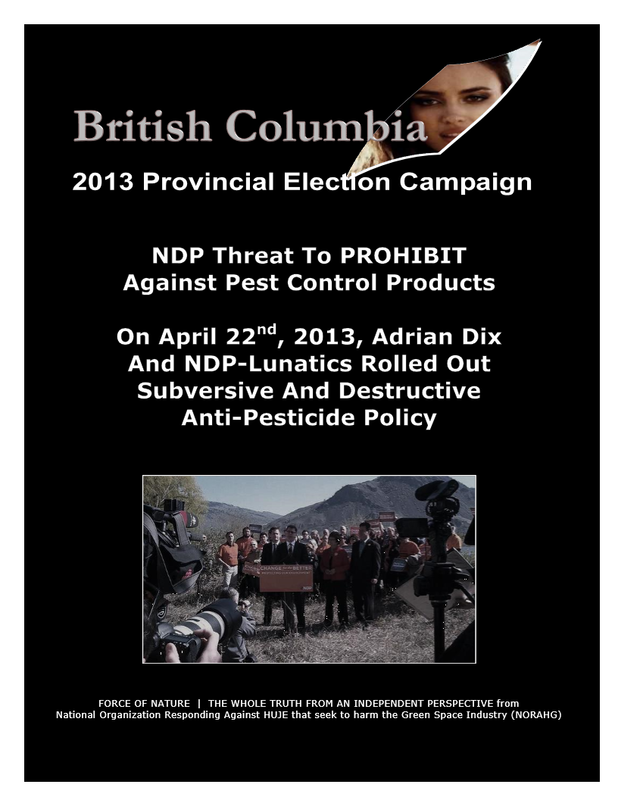 On May 30th, 2012, New Democratic Party ( BC NDP ) introduced a PROPOSAL TO ARBITRARILY PROHIBIT against pest control products used in British Columbia. 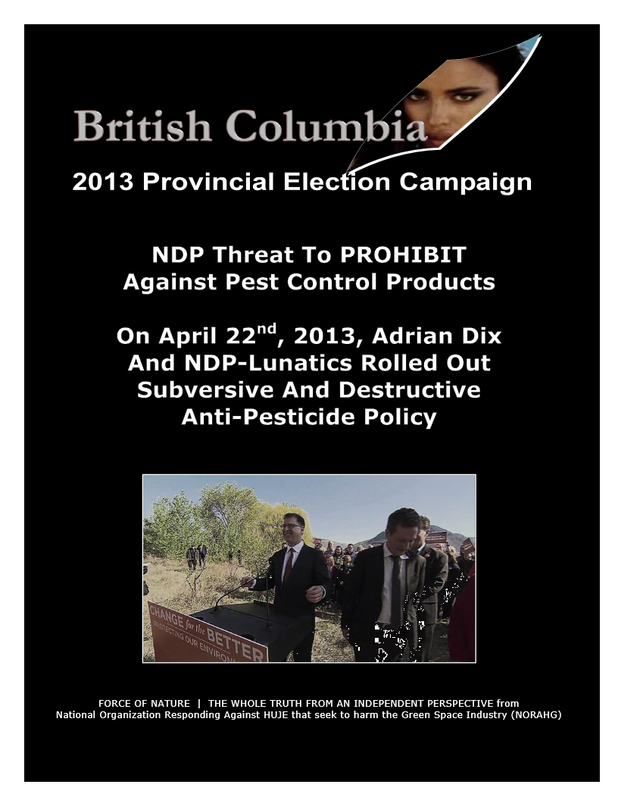 In total, New Democratic Party made FOUR ATTEMPTS to bring into law a province-wide PROHIBITION against the use of pest control products in British Columbia. We introduced this legislation a number of years ago first, and then again last year [ 2010 ] on Earth Day. 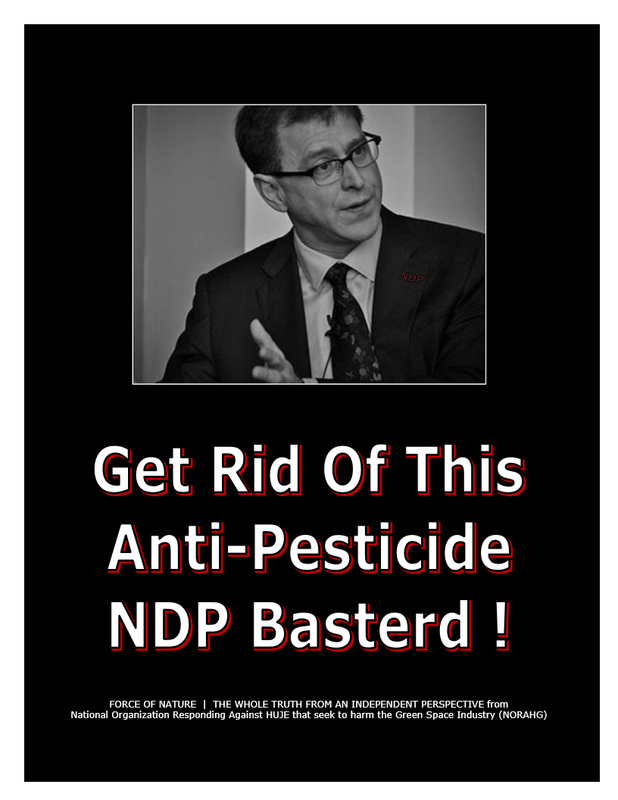 For example, on May 30th, 2012, Opposition NDP Anti-Pesticide Lunatic-Leader Adrian Dix personally ATTEMPTED TO INTRODUCE AN ILL-FATED BILL called the Cosmetic Use of Pesticides Control Act in the legislature. 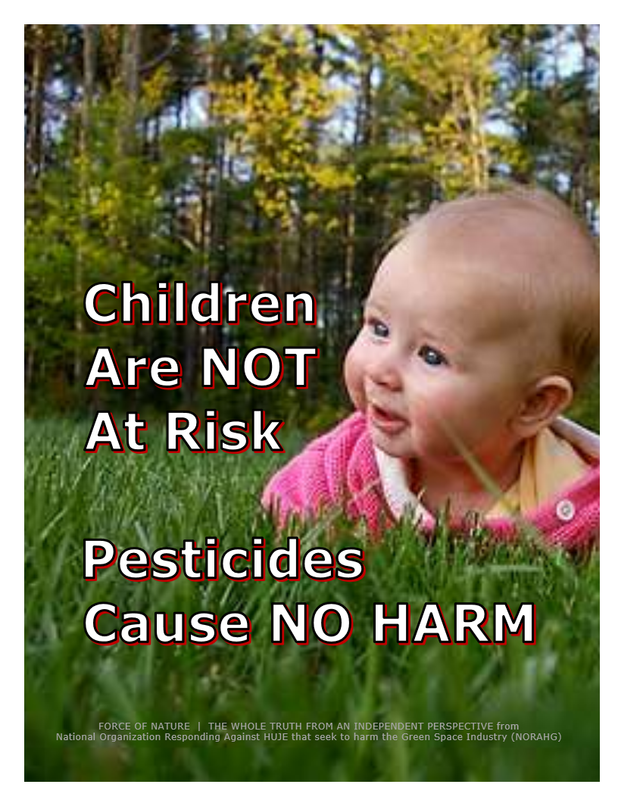 Dix was DESPICABLE in his EXPLOITATION of CHILDREN as WEAPONS OF COERCION and ULTIMATE ANTI-PESTICIDE TERROR. Dix EXPLOITED CHILDREN merely to ENRAGE AND ALARM the public into believing that PROHIBITION was somehow necessary. PROHIBITION that is imposed under the PRETEXT of protecting children’s health is WRONG ! It is COMMON KNOWLEDGE that pest control products are SCIENTIFICALLY-SAFE, CAUSE NO HARM, and are NO THREAT TO CHILDREN. Canadian Association Of Physicians For The Environment [ A KNOWN ANTI-PESTICIDE AND ENVIRO-TERRORIST ORGANIZATION ] has created an open letter allowing Canada’s health professionals to SUPPORT A LAWN PESTICIDE BAN ACROSS BRITISH COLUMBIA. The letter — which was signed by nearly 100 doctors, nurses, and other health experts in its first week alone — will soon be presented to the BC government. CAPE and its PARTNERS have been campaigning for a BC pesticide ban for a number of years. The campaign has included a major advertising effort, in-person meetings with BC’s Environment Minister and NDP LEADER ADRIAN DIX, and a massive online initiative which resulted in thousands of pro-ban e-mails being sent to government. CAPE urges all health professionals — doctors, nurses, therapists, psychologists, and others — to sign the open letter by going on-line. Health professionals from across Canada ( not just BC ) are urged to sign the important letter. Every person who signs — no matter where they live — adds weight to the campaign. Not surprisingly, NOT A SINGLE PERSON within New Democratic Party ( NDP ) has ANY recognized expertise, training or background in matters concerning pest control products. New Democrats like Adrian Dix are RIDICULOUSLY IMPLYING that their NON-EXPERT ASSESSMENT is somehow being withheld from Health Canada and EVERY other regulatory agency in the world. Health Canada, and NOT Adrian Dix, and NOT New Democratic Party, has the ESSENTIAL EXPERTISE regarding pest control products. The OVERWHELMINGLY MASSIVE AND DETAILED ASSESSMENTS performed by Health Canada are being DISCREDITED by Adrian Dix and NDP-Lunatics who decided to set their own agendas for conspiring to change public policy regarding pest control products. The ONLY people that truly have ANY recognized expertise, training or background in matters concerning pest control products are the HUNDREDS of expert scientists at Health Canada. Health Canada oversees the testing and approval of pest control products by using SCIENCE-BASED EVIDENCE in order to ensure that they are SCIENTIFICALLY SAFE and will CAUSE NO HARM. In other Provinces in Western Canada, Government Officials are now INCLINED TO ALSO STRONGLY SUPPORT the use of SCIENCE-BASED EVIDENCE when assessing pest control products. Moreover, Government Officials are NOT INCLINED TO CREATE RESTRICTIONS OR LAWS THAT CONFLICT WITH HEALTH CANADA. Consequently, Government Officials are NOT INCLINED TO PROHIBIT ANY PEST CONTROL PRODUCT in their jurisdictions. For example, in 2011, the GOVERNMENT OF ALBERTA STOPPED THE TREND towards needless, senseless, and malicious PROHIBITION. And in 2012, BRITISH COLUMBIA’S SPECIAL COMMITTEE ON COSMETIC PESTICIDES DID NOT RECOMMEND PROHIBITION against the use of pest control products in the Urban Landscape. In British Columbia, a vote for New Democrats will DESTROY ALL BUSINESSES operating in the Professional Lawn Care Industry. The DEVASTATION AND DESTRUCTION of the Professional Lawn Care Industry will be EXTENSIVE because there are NO valid economical alternatives to replace the prohibited products. Consequently, businesses operating in the Professional Lawn Care Industry will be INCAPABLE of providing adequate weed and insect control, and will UNABLE to keep their customers satisfied. In provinces like Ontario, PROVINCIAL PROHIBITION created a TRAIL OF ECONOMIC DESTRUCTION WITH HUNDREDS OF SMALL BUSINESSES DESTROYED AND THOUSANDS OF PEOPLE OUT OF WORK, a MORE DANGEROUS OUTDOOR ENVIRONMENT, and a BLACK MARKET IN PESTICIDES. Because of Ontario’s PROVINCIAL PROHIBITION, the Professional Lawn Care Industry LOST OVER 500,000,000 DOLLARS, with UP TO 12,500 UNEMPLOYED. In Ontario, ONE-COMPANY-PER-WEEK DISAPPEARED INTO TOTAL OBLIVION. In Quebec, OVER 60 PER CENT of the Professional Lawn Care businesses were ANNIHILATED AND DESTROYED because of PROVINCIAL PROHIBITION. Even now in British Columbia, as a direct result of MUNICIPAL PROHIBITIONS, Professional Lawn Care businesses LOST OVER 40 PER CENT OF THEIR CUSTOMERS. It is now time for the Professional Lawn Care Industry to select a municipality that has IMPOSED an Anti-Pesticide PROHIBITION, and SUE ITS BRAINS OUT ― this will serve as an example to ALL Anti-Pesticide Terrorists. Government Officials must be made to THINK TWICE before ARBITRARILY IMPOSING Anti-Pesticide PROHIBITION. Moreover, ALL Anti-Pesticide Terrorists must be HOUNDED, no matter where they are ― specifically David Suzuki, whose two-year contract with public television must not be renewed beyond 2014 ― Suzuki’s reign MUST BE ENDED. Suzuki, and ALL Anti-Pesticide Terrorists, must MAKE AMENDS FOR THEIR ACTS OF TERRORISM ― Adrian Dix. Barbara Kaminsky. Gideon Forman. Kathryn Seely. Mae Burrows. Selina Robinson. And others. And New Democrat Basterds MUST BE STOPPED in the 2013 Provincial Election. Dix’s reign MUST ALSO BE ENDED. Anti-Pesticide PROHIBITION has already DESTROYED the Modern Professional Lawn Care Industry in many jurisdictions across Canada. Anti-Pesticide PROHIBITION was/is NEEDLESS, SENSELESS, MALICIOUS, and UNNECESSARY. PROHIBITION is NOT NECESSARY since pest control products are GOVERNMENT-APPROVED, FEDERALLY-LEGAL, SCIENTIFICALLY-SAFE, PRACTICALLY-NON-TOXIC, and CAUSE NO HARM. Any PROHIBITION against pest control products is NOT JUSTIFIED because STRICT REGULATIONS based on scientific research already PROTECT our health and our environment. ALL PROHIBITIONS are 100 per cent Politically-Based and 0 per cent Science-Based. Anti-Pesticide PROHIBITIONS represent a TRIUMPH OF SENTIMENT OVER SCIENCE. The MAJOR SOURCE of exposure to pest control products is from FOOD SUPPLY, and NOT the Urban Landscape. PROHIBITION is NOT necessary, and has led to CATASTROPHIC CARNAGE such as BUSINESS FAILURES and UNEMPLOYMENT, and even DEATH. In jurisdictions like Ontario, PROHIBITION led to the DEATH of an elderly man who was forced to hand-pull TOXIC NOXIOUS WEEDS. In jurisdictions where PROHIBITION has been IMPLEMENTED, the Professional Lawn Care Industry has SUFFERED IMMENSE LOSSES, in the HUNDREDS OF MILLIONS OF DOLLARS. Moreover, because of PROHIBITION, green spaces are OVER-RUN WITH WEEDS, INFESTED WITH INSECTS, and DISMALLY DESTROYED ― they look like GARBAGE DUMPS. DISCOVER WHAT ANTI-PESTICIDE AND ENVIRO-LUNATIC TERRORISTS ARE DOING AND SAYING ABOUT SUBVERSIVELY IMPOSING THEIR LIFE-STYLE CHOICES AGAINST OUR SOCIETY. Read … Force Of Nature ― The Whole Truth From An Independent Perspective. Communities and businesses are being HARMED and DESTROYED and RAPED by PROHIBITIONS against pest control products used in the Urban Landscape, and by other ACTS OF ENVIRONMENTAL TERRORISM. We are living in the 9|11 Era of Anti Pesticide and Environmental Terrorism where at least ONE SUBVERSIVE ACT OF TERROR is perpetrated EVERY SINGLE DAY by these terrorist. We are living in the DARK AGE OF ANTI PESTICIDE TERRORISM where sound science is trumped by FAKE SCIENTISTS, JUNK SCIENCE and UNVERIFIABLE SECRET EVIDENCE through FABRICATION, INNUENDO, and INTERNET RUMOR ― scientific research PROVES that pest control products CAUSE NO HARM and can be USED SAFELY. An informed public is better able to protect itself and its communities and businesses from so-called activists who are THE LEAST QUALIFIED TO PROVIDE ANY ADVICE about pest control products or the environment. NORAHG is the National Organization Responding Against HUJE that seek to harm and destroy the Green space industry, and the well being of our communities. NORAHG morally represents the VAST SILENT MAJORITY of people associated with turf and ornamental plant maintenance who are OPPOSED to Anti Pesticide PROHIBITION and the CLOSURE or ABANDONMENT of green spaces under the RIDICULOUS PRETEXT of somehow « saving » the environment. NORAHG is a NATIONAL NON PROFIT NON PARTISAN organization that does not accept money from corporations or governments or trade associations, and represents NO VESTED INTERESTS WHATSOEVER. NORAHG is dedicated to reporting the work of RESPECTED and HIGHLY RATED EXPERTS who promote ENVIRONMENTAL REALISM and PESTICIDE TRUTHS. NORAHG pledges to deliver comprehensive reports that are worthy of peoples’ time and of peoples’ concern, reports that might ordinarily never have breached the parapet. NORAHG was the brainchild of William H. Gathercole and his colleagues in 1991. Mr. Gathercole is now retired, although his name continues to appear as founder. Force Of Nature was launched by NORAHG for CONTINUOUS transmission on the Internet on January 1st, 2009 ― however, the VERY FIRST Stand-Alone FORCE OF NATURE Report was issued on September 19th, 2008. On January 1st, 2009, Force Of Nature Reports were launched for CONTINUOUS transmission on the Internet ― however, the VERY FIRST Stand-Alone Force Of Nature Report was issued on September 19th, 2008. On March 15th, 2010, Uncle Adolph independently launched The Pesticide Truths, an easy-to-use Web-Site that collects relevant reports of information right-off-the-press. Pesticide Truths and Force Of Nature, in some ways, are like Google for everything concerning the SUBVERSIVE ACTIVITIES of Anti-Pesticide and Enviro-Lunatic Terrorists.